Get your smartphone and download Oklahoma’s Annual Conference app right now. 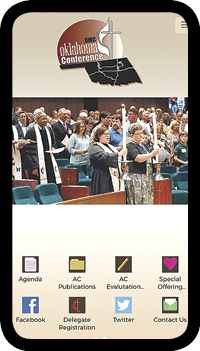 You’ll find OKUMC in the iTunes (APP STORE) or Google Play store. This free software application, launched by your Communications Ministry, enables you to quickly access on your mobile device all the information you need for your annual conference experience. Among the contents you’ll find are a daily agenda, special events, social media feeds, even restaurant locations. Click to open the Pre-Conference Workbook. Click to donate to the Annual Conference Offering for Circle of Care. Tell your friends far away that they can download OKUMC and watch the meeting’s live stream. You also can choose to receive push notifications for specific groups: all delegates, laity, clergy, and/or youth delegates. If you need help downloading or navigating the app, volunteers will be available at the on-site registration tables.